I finished the body, and Schecky was smitten immediately. At this point, Henry looked something like the brown, sweater-wearing love child of Mr. Peanut and a bowling pin. With a really oversized head. Honestly, I am not sure if I did something wrong, or if his head is supposed to be so melon-like. Scheck announced that he loved him, he was perfect, and could he sleep with him? I replied that of course he could sleep with him, but that I would need Henry back because he needed his arms and legs. Me: What do you mean "No?" Scheck: No. No arms and legs. NO! Me: Don't you take that tone with me, young man! Oh. My. God. I did NOT just say that. At what point did I turn into someone's cranky little grandmother??? Scheck: Please don't make him have arms and legs! Please, please, please, please???? Me: Potpie*, Henry needs arms and legs. He's a bear. He looks kind of....stumpy without them. Scheck: But I love him! I love him just the way he is! PLEASE????? Me: Don't you think he'll be sad that he doesn't have arms and legs? Scheck: No - because he's a baby. Me: Ummmm - OK. < long pause > You do know that real babies have arms and legs, right? Lighten up, Frances and stop being such a control freak. 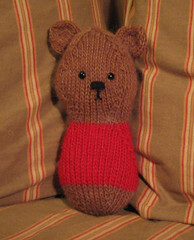 You told Scheck you'd make him a bear, and since he doesn't want arms and legs - don't make arms and legs. Is that really so difficult??? Duh. Sometimes I just have to give myself a good reality check. Scheck loves him and that's the most important thing, right? And Scheck did allow me to make the ears, because how are you supposed to know it's a bear if it doesn't have ears. So I will just embrace Baby Henry as is. Even though he looks like a Thalidomide baby. A Hydroencephalitic Thalidomide baby. *Scheck's other name, besides Schecky. Henry's pattern is a Jess Hutch design. snap. Shecky just schooled you! BabyHenry reminds me of Sherilyn Finn's character in Boxing Helena. Baby Henry looks like he is the perfect size and shape for a little one to hug! Well, I guess Henry IS finished!